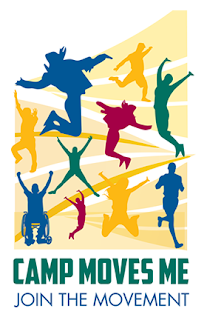 In addition to the multitude of the special programs, many campers have returned from their cabin trips lately. Cabin trips are an opportunity to push the boys outside of their comfort zones and experience nature. 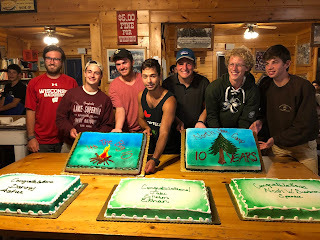 Trips are also fantastic bonding opportunities as the boys go with their entire cabin, counselors, and a wilderness trip leader. I6 went on a 3-day, 2-night trip on the Flambeau river. They made it to their second night campsite on the first night after a fantastic group effort paddling. The next day they were looking for a new campsite and were invited to stay on a private site a bit upstream. Despite the detour, the counselors of I6 reported that the positive attitude of the campers never wavered. The boys enjoyed the site's bathrooms with mirrors. The second night the boys played games and joked in their tents despite less than ideal weather. 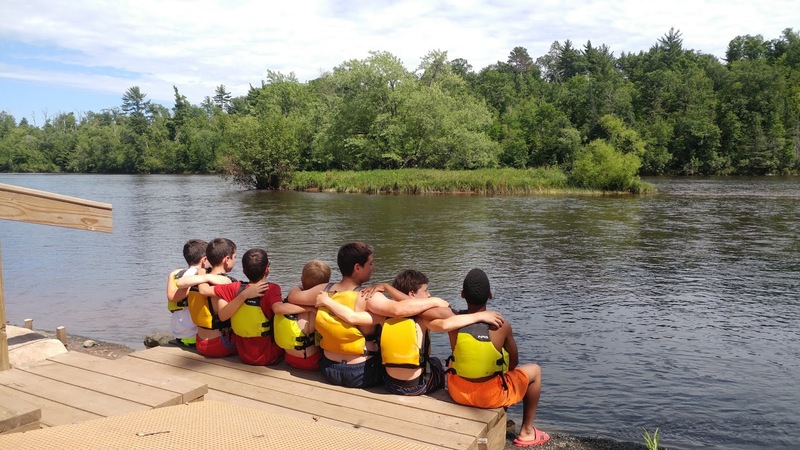 On the third day, the cabin enjoyed canoeing down both Cedar Rapids and Beaver Dam. 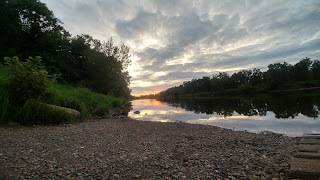 I3 also went on the Flambeau, and had to paddle hard to reach their first night campsite before it started raining. They made it, and were able to set up their site quickly as the rain started to fall. They were able to learn how to keep a fire going despite the rain and set up a tarp so they could cook dinner. They had a short paddle on the second day, and made it to a campsite near Cedar Rapids. It rained a bit that afternoon, which made the boys laugh while they played cards in their tent. The clouds cleared away and the cabin ran Cedar Rapids, and even those who capsized were having fun. That evening they played a game called camouflage in the enchanted forest near the campsite. The final day was more relaxed, and they recited riddles on the water. One of their counselors, Jonah Rane, is a high school coxswain, and on this day he called out the strokes for the cabin, helping them keep pace. 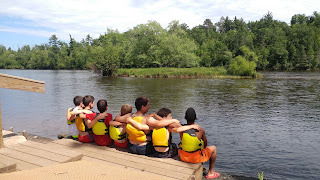 The campers of I1 went on the Nam-St. Croix, and enojyed some beautiful scenery, especially at a campsite called Sand Rock Cliffs. At this site, they played games and told stories to pass the time. They were lucky with the weather, and only had a short spell of rain one day at lunch. To keep the cook dry, they set up a tarp over the "kitchen". They raved about their tripper Shiva's meals, and returned with a new affinity for Indian spices. I2 also went on the Nam-St. Croix, and canoed 28 miles from start to finish. The food was also a hit on this trip, they enjoyed favorites such as quesadillas and pita pizzas. They floated and swam in the river, and at one point the campers saw "the biggest fish ever", a catfish about 4-feet long. They were still raving about the size of the fish when they returned to camp. In addition to that fish, they were able to watch a swimming snake, and these interesting animals helped them appreciate the nature on their trip. 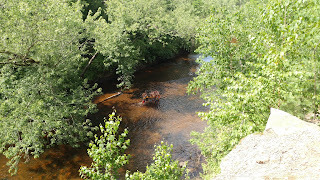 J2 went on a 2-day trip on the Namekagon River, commonly known as the "Mighty Nam". They also experienced a bit of rain, but loved the food on the trip. Culinary highlights included Pita Pizzas, S'mores, and carmel delights. The campers also loved brownie pancakes in the morning. The trip was a great first overnight for the many of the campers, and they're already excited for a longer trip next summer. It has been a busy few days since the last update. The Senior Village is finishing up College Days this evening, while the rest of camp has been enjoying some extra attention on their activities without Senior Village campers. They also participated in a modified Superhero themed Predator Prey. Wednesday evening's village campfires were forced inside because of rain, yet the Junior and Intermediate village staff found ways to still make these nights memorable. College Days has been busy since Tuesday, with events such as trivia, a Euchre tournament, football and volleyball keeping our Senior Village campers busy. There as a march-madness style basketball tournament in which each of the four college days teams was divided further into four five-man basketball teams. The tournament was a lot of fun, and Max Dunn secured the biggest upset of the day with a game-winning layup. The arm wrestling competition included a tense matchup between Bennett Crane and Aidan Black that felt like it was never going to end. Today is the final day of college days, and has included events such as cheer writing, plaque making and a mascot competition, as well as tug of war. The teams also raced in an outdoor themed relay event that included a paddling portion, a portage, and a fire building component. Still to go is the cook off, where each team will prepare a three course meal for a few staff judges, and the bowling and karaoke events. Predator Prey is a cabin based game that sees each cabin take on the role of a species on the food chain. The cabins need to find water, food, and shelter to survive. To mix it up, this predator prey was superhero themed. Wolverine and Superman were put at the top of the food chain. Iron Man and Captain America were among the middle tier, the lowest in the hierarchy included Black Widow and Green Lantern. Predator Prey is enjoyed by campers because it requires running and a bit of strategy in finding resources needed for survival. In lieu of their village campfire, the Junior Village had its first "invention convention". Each cabin was given a bag filled with random objects such as a mask, a paper towel roll, some balloons and a deck of cards. They were given a half hour to invent a product and sell it to staff judges in a short commercial. Some of the inventions included a confetti popper and a "paradise viewer", a homemade virtual reality device to make the user feel they are beachside. The Intermediate Village had a talent show and a game of musical chairs that the entire village participated in. Tomorrow's Friday Night Service will have the theme of perseverance and grit. On Saturday, campers will begin the second half of their second week of activities.